The Hoya Con Bio MedLite II laser machine offers two wavelengths, which helps make it one of the most effective cosmetic laser machines on the market in completing multi-color tattoo removal. With its 1064 nm wavelength, the Hoya Con Bio MedLite II laser equipment becomes a formidable foe against blue and black tattoo inks, while its 532 nm wavelength helps it defeat stubborn red tattoo inks. If you would like to add stronger multi-color tattoo removal power to your dermatology office, health practice or medical spa, the Hoya Con Bio MedLite II can do that for you. 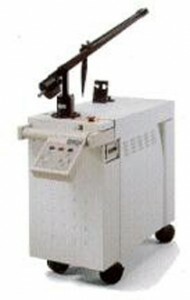 Just contact SunrayLaser.com today to receive no obligation pricing information on our stock of refurbished and used Hoya Con Bio MedLite II laser machines. SunrayLaser.com hopes to build long term relationships with all of our customers. After you buy a used cosmetic laser machine from us, we want you to be a SunrayLaser.com customer for life. That is why we offer a 100% satisfaction guarantee on all of our new and used cosmetic laser systems, including on our used inventory of the Hoya Con Bio MedLite II laser machine. Contact SunrayLaser.com today to receive an absolutely no obligation price quote on a pre-owned Hoya Con Bio MedLite II laser system. One of our trusted SunrayLaser.com representatives will also be able to any questions you may have about the Hoya Con Bio MedLite II laser equipment.